While I might sing the praises of purple glosses, red is a classic lip colour for good reason. Being re-introduced to a product I liked the first time around is always a treat. 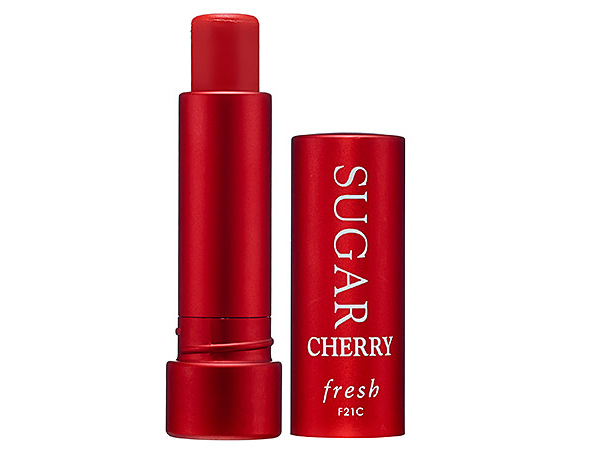 Fresh Sugar Lip Treatment SPF 15 ($26 at Sephora) is a charming, cherry-scented reminder of both truths. I liked the plum version when I tried it two years ago, but I much prefer the new cherry flavour for its superior pigment payoff and bright red hue. As always, the formula packs long-lasting moisture (it stayed on through two morning coffess, lunch, and lots of deep-thought-induced lip-pursing at my desk), and a melt-on-your-mouth texture. SPF 15 is just the cherry on top. I had this given to me by Sephora while shopping there on my birthday!! Loved it. Wish I could get Sephora"s dry shampoo called SUGAR since I am laid up with a broken leg and desperately need some good dry shampoo! !